Low profile ( floating) Elk wing Caddis. Give me a time line for your flies. I would like to have it wrapped up by March 1st. Is that good with everyone? March 1st works for me, as long as NEFF is still around.. I just finished. 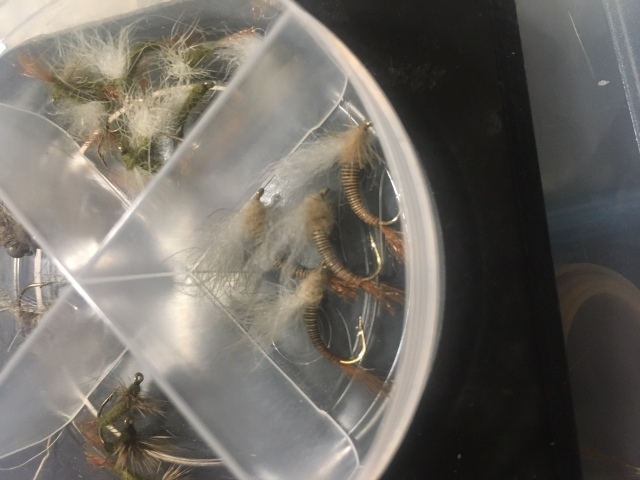 I have my favorite jig nymph and blowtorch tag nymph for the swap and I have two dozen nymphs tied for PHW. Amazing what cold weather can produce. Where do we send the flies? I realize that it's a bit of a running joke...but if NEFF's existence on March 1st is a possible concern, then perhaps we should each PM TomFly our email address so communication for the swap gets completed. March 1st should be fine for my flies being ready. PM me when you are ready for my address. I'm done with the Bird's Nests and the Olive Emergers (tied a bunch of extra olives) for the Healing Waters donation, and the Red Quill Emergers for the swap folks. I've tied more Red Quills after taking this pic....I'm waiting on some size small silver thread for the SOS flies. Tried tying with x-small and didn't like em..